The modular devices of the DEHNguard SE DC product series are coordinated single-pole type 2 surge arresters with a functional design. When developing this device series for protecting d.c. systems, the main focus was on the increased requirements of d.c. applications with regard to device safety in all operating states. The extremely powerful d.c. switching device DCD, which prevents fire damage caused by switching arcs, is the core of the DEHNguard SE DC devices. DEHNguard® SE DC … (FM) is coordinated with DEHNsecure … (FM) type 1 lightning current arresters (minimum decoupling length of 1 m must be observed). The DEHNguard SE DC devices combine high performance and ease of use in a single device. Their electrical parameters are rated for the most stringent requirements within lightning and surge protection systems. The high number of features shows that the main focus is both on reliable surge protection and device safety. Proven heavy-duty varistors are used to discharge high impulse currents and limit the destructive surge impulses to the specified voltage protection level values. The operating state of the arrester is permanently monitored via the surface temperature of the heavy-duty varistor and the d.c. switching device DCD is immediately activated in case of overload. The mechanical visual indicator with green and red indicator flags, which is available for each protective path, is directly connected to the d.c. switching device DCD. When the red indication appears in the inspection window, the d.c. switching device DCD has already safely interrupted the d.c. switching arc and thus reliably ensured fire protection. 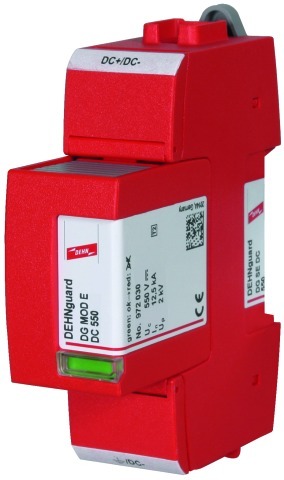 In case of the DEHNguard SE DC … FM version, the arrester status can be additionally indicated via a three-pole remote signalling terminal. The special design of the d.c. switching device DCD even ensures a short-circuit withstand capability up to 300 A d.c. - without arrester backup fuse (! ).In combination with the specified backup fuses, the short-circuit withstand capability can be even increased to 2000 A d.c., which is certainly an innovation in the field of d.c. applications. The single-pole devices are available for voltages from 60 V to 900 V d.c. and can thus be used for a variety of applications. DEHNguard SE DC type 2 surge arresters can be used for example for emergency power supply systems, d.c. systems for direct supply of d.c. drives, control circuits and battery-operated supply systems of any kind. To implement these numerous features, the devices incorporate the modular Red/Line family design with a width of 1.5 modules. The mechanical design of the connection points is another safety feature. The covered screws ensure an additional degree of shock protection and the projections for easily and safely entering the cable increase clearances and creepage distances so that no distance to other equipment must be maintained even in case of voltages up to 900 V d.c. The coded plug-in protection modules ensure a high degree of protection. Consequently, damage caused by installing an incorrect module can be virtually excluded.